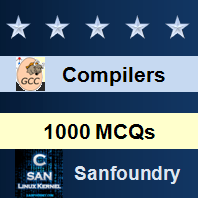 This set of Compilers Multiple Choice Questions & Answers (MCQs) focuses on “Syntax Directed Definition & Translations Questions and Answers – Sanfoundry “. 2. In what module multiple instances of execution will yield the same result even if one instance has not terminated before the next one has begun? Explanation: Re enter-able module is the reason why the compiler is used in the first place. Explanation: Modular design, or “modularity in design”, is a design approach that subdivides a system into smaller parts called modules or skids that can be independently created and then used in different systems. 4. Which one of the following is the tightest upper bound that represents the time complexity of inserting an object into a binary search tree of n nodes? 5. Which of the following is true for machine language? Explanation: Machine code or machine language is a set of instructions executed directly by a computer’s central processing unit (CPU). Each instruction performs a very specific task. Explanation: In computer science, real-time computing (RTC), or reactive computing describes hardware and software systems subject to a “real-time constraint”, for example operational deadlines from event to system response. Explanation: In computer science, and specifically in compiler and assembler design, literal pool is a lookup table used to hold literals during assembly and execution. 9. Which loader function is accomplished by loader?